The concert hall that was built between 1905 and 1908 by the architect Lluis Domenech i Montaner was taken to UNESCO World Heritage list in 1997. This hall had a big role in Catalan Renaissance and was built for Orfeo Catala Musica. For the hall construction, wealthy and also Catalan people made huge contributions. The inside of the concert hall was generally made of natural elements like glass and ceramics. The façade part is a symbol of Art Nouveau and Gothic elements. Palau de la Musica Orfeo is located at La Ribera region in Barcelona city. If you plan a Barcelona Travel in seasonal times except summer then you must arrange a performance ticket and see the building with a performance. Of course you can visit Orfeo Catala Musica in summer when there are no performances but it would be a good chance to see the hall by paying a bit more as you will already pay entrance fee around 20€. Don't forget not all the performances are cheap but for a Flamenco night you would pay around 35€. There are various performances such as choirs, flamenco nights or private concerts so the best thing that is selecting a performance according to your preferences and budget and make the best of Palau de la Musica Orfeo visit. Below please find the website and check the performances during the season. Barcelona city guide will keep on write about 2017 Barcelona events. 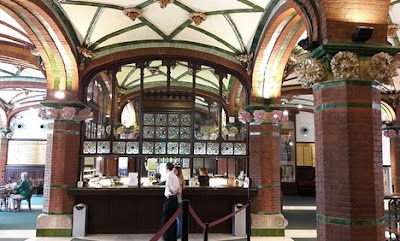 For Palau de la Musica Orfeo we have Barcelona travel tips. Please check the seat zone and try to buy a ticket for first floor. Balconies and second floor's angle of sight can be worse according to performance type. Some popular performances are Carmen Carmen, Four Guitars, Opera Y Flamenco, Shlomo Minz. 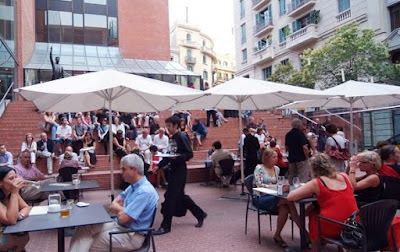 Apart from concerts you can have dinner at Palau de la Musica Orfeo. You can find good service, food and atmosphere at Palau restaurant. It has an outdoor area and you can sit there both in summer and winter as it has heating and cooling system. It has assorted menu so there should be menu for anyone. 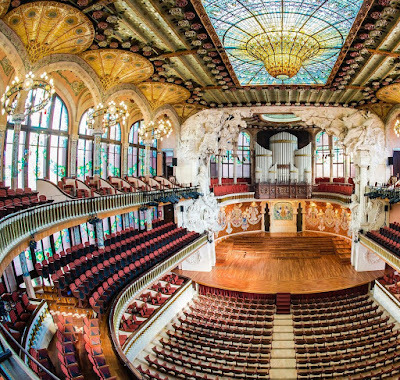 What can you do in Palau de la Musica Orfeo? You can enjoy the Palau shop if you like. The Palau shop is located at in the Art Nouveau Foyer Area and it has a huge selection of souveniors such as decorative items, toys and musical reading books for children, CDs of various choirs and books. 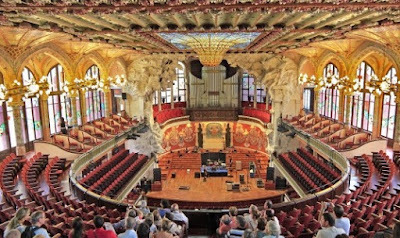 As you see there are lots of things to see in Barcelona city and Palau de la Musica Orfeo is just one of them. For updated performances please check the hall web site below. Thanks for the video. Please contact to us if you think copy,ng is prohibited.Palau de la Música Catalana from Marco Zouvek on Vimeo.